(Nanowerk News) Researchers at Tokyo Institute of Technology (Tokyo Tech) have developed an easy-to-use, tunable biosensor tailored for the terahertz range. Images of mouse organs obtained using their new device verify that the sensor is capable of distinguishing between different tissues. The achievement expands possibilities for terahertz applications in biological analysis and future diagnostics. Plasmonics are highly sought-after technologies for device applications in security, sensing and medical care. They involve harnessing the excitation of free electrons in metals that are called surface plasmons. One of the most promising applications of plasmonic materials is the development of ultra-sensitive biosensors. 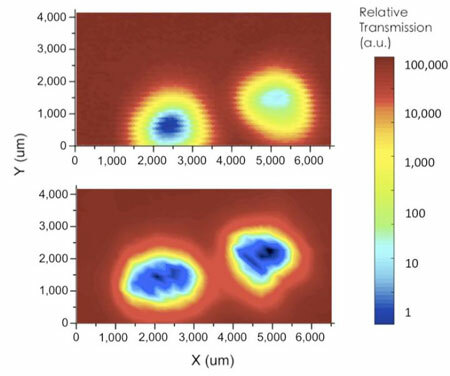 The ability to combine plasmonics with emerging terahertz (THz) technologies for detecting tiny, biological samples has so far proven challenging, mainly because THz light waves have longer wavelengths than visible, infrared and ultraviolet light. Now, Yukio Kawano and colleagues at Tokyo Tech's Laboratory for Future Interdisciplinary Research of Science and Technology working in collaboration with researchers at Tokyo Medical and Dental University have found a way to overcome this barrier by designing a frequency-tunable plasmonic-based THz device. One of the key features of the new device is its spiral bull's eye (SBE) design (see Figure 1). Due to its smoothly varied grooves, "the groove period continuously changes with the diameter direction, resulting in continuously frequency-tunable characteristics," Kawano says in their study published in Scientific Reports ("Continuously Frequency-Tuneable Plasmonic Structures for Terahertz Bio-sensing and Spectroscopy"). Another advantage of the new design is that it incorporates a so-called Siemens-star aperture, which enables a user-friendly way of selecting the desired frequency by simply changing the rotation of the spiral plasmonic structure. "The device also increases the electric field intensity at the subwavelength aperture, thus significantly amplifying the transmission," Kawano says. 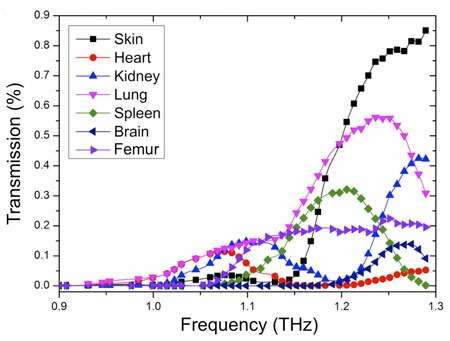 In preliminary experiments to assess how well the new device could visualize biological tissues, the researchers obtained THz transmission spectra for various mouse organs, as shown in Figure 2. To probe further, they also conducted THz mapping of mouse tails. By comparing images obtained with and without the SBE design, the study showed that the former led to a markedly improved ability to distinguish between different tissues such as hair, skin and bone (see Figure 3).